Read Smithsonianscience.si.edu news digest here: view the latest Smithsonian Science Si articles and content updates right away or get to their most visited pages. Smithsonianscience.si.edu is not yet rated by Alexa and its traffic estimate is unavailable. It seems that Smithsonian Science Si content is notably popular in USA. We haven’t detected security issues or inappropriate content on Smithsonianscience.si.edu and thus you can safely use it. 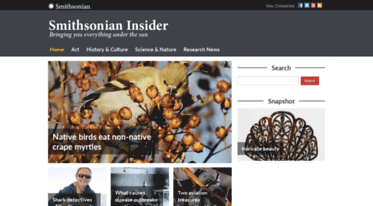 Smithsonianscience.si.edu is hosted with Smithsonian Institution (United States) and its basic language is English. Taking you beyond the bricks and mortar of the Smithsonian’s 19 museums and 9 research centers, to share the astounding and diverse work being conducted by the Smithsonian around the world.